For a man whose money is not all plastic, but cash we offer these stylish money clips. All of our items presented are professionally designed using the finest craftsmanship, top quality materials and modern technologies. Created in platinum, 18, 14, 10k gold or 925 sterling silver, encrusted with diamonds, these accessories make a real statement! 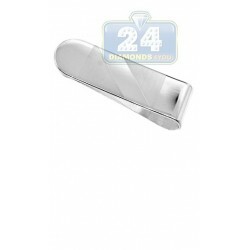 Some of our money clips can be personalized with engraving for a unique personalized gift. We also offer custom made money clip production and you could be an owner of the unique, one of a kind piece no one owns! Money ClipsThere is 1 product.